Outlandish Observations: Thinking of reading the last page first? THE SCOTTISH PRISONER is here! Thinking of reading the last page first? 20th Anniversary edition of DRAGONFLY? 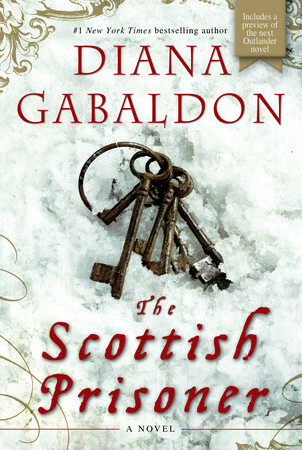 Jamie Fraser, "My Book Boyfriend"
FIERY CROSS unabridged audiobook update! It's worth noting that Diana said similar things, repeatedly, before ECHO was published in 2009. I'm not going to comment on the final scene in SCOTTISH PRISONER until Tuesday, but I do agree with Diana that it will be much more meaningful if you see it in context. Ultimately, though, it's a decision that you'll have to make for yourself. Very excited, though; I can't wait to read it! I don't understand how anyone could ever want to read the last page first! I admit that I sometimes might take a peak at it, but only when I'm way into the story and have an idea of how the story might end. In this case though we all already basically know how the story (of Jamie and John and William) continues so you shouldn't even expect anything too surprising on the last page. I know people who do that, but I just can't. I'll even cover the page with my hand to keep my eyes from sneaking ahead when I can tell something 'big' is about to be revealed. I am so glad the wait for this book is almost over. I am one of those people who occasionally starts at the end of a book - but in the case of Diana's books NEVER!!!! I made the mistake of skimming ahead to see where Echo was going, during a tedious (sorry, DG) part, and found out Claire had married Lord John! Needless to say, I was shocked, appalled, devastated, crushed, etc. If I'd just minded my business and stuck to the storyline, I'd have known he wasn't on the damn ship! I'm a reformed Peeker, now. Hi, I read the last page when I can't stand the suspense any longer. So, I only do it with extremely 'nailbitingly' interesting books. For me it's a matter of then being able to settle back and thoroughly enjoy the book, rather than climbing the walls.